10910 N. RR 620 in Austin. AUSTIN (Austin Business Journal) – AMLI Residential is ready to add apartments to a rapidly-growing master-planned community. The firm announced it will build a 279-unit mid-rise apartment project on Simond Ave. in central Austin’s Mueller Town Center. The property will include four or five stories of residential units as well as about 8,000 sf of retail space. Fifteen percent of the units will be available through Mueller’s Affordable Homes Program. 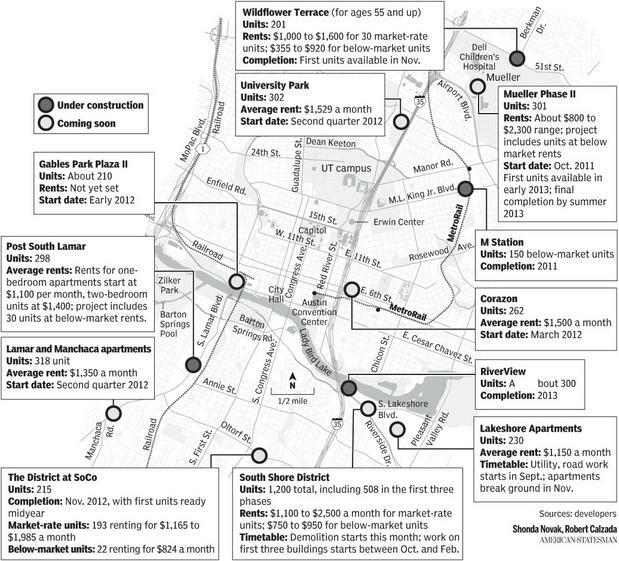 With occupancy rates hitting 96% or more and rental rates also hitting record highs, developers are looking to get on the Austin apartment bandwagon. Average rents are now at $1190 per month. All of the complexes are either under construction or planned. In its first push into luxury apartment development, Austin-based Cypress Real Estate Advisors plans to build four complexes in Austin that will total $200 million worth of new development and add 1,112 units to a multifamily market where rents and occupancies have risen to record levels. Cypress' projects call for a 318-unit complex at South Lamar Boulevard and Manchaca Road; 302 apartment units at University Park, a planned mixed-use development on the former Concordia University campus north of downtown ; 262 units in Corazon, a project planned in the block bounded by East Sixth, East Fifth, San Marcos and Medina streets; and a 230-unit complex set for the South Lakeshore Boulevard area off East Riverside Drive and Tinnin Ford Road, where older apartments have been razed to make way for the new upscale units. The Lakeshore project is scheduled to be the first to break ground, with road and utility work set to start in August, followed by construction on a three-story apartment building in September. It will be the first phase of a larger project planned for 50 acres that could also include townhomes and office space. Over the past 20 years, the Austin metro area, including southern Williamson and northern Hays counties, has had a net increase in leased apartments of about 4,000 units a year, but in recent years that number has increased to 12.000/yr. • Post South Lamar, a 298-unit complex that Post Properties Inc. of Atlanta is building at 1500 S. Lamar Blvd. The University Park Apartments, planned for the former Concordia University campus, would have 302 units averaging 827 square feet. Construction could begin next summer and take a year. Two Austin-based companies have teamed to form a new business that plans to build 1,000 apartments in four projects over the next two to three years across Central Texas, company officials said. The first two projects are expected to be in the Lakeline Mall area, and one could be under construction before the end of the year. The first project could be on 22 acres at the northwest corner of Parmer Lane and Spectrum Drive, part of the Davis Springs Corporate Center project that HPI Real Estate and Captex developed, or on a 20-acre site in the same area that HPI and Captex hope to have under contract by Friday, said Fred Eppright, a partner with Captex along with John Simmons. An application was filed Monday for a zoning change to a multifamily use for the 22 acres, he said. HPI Residential intends to build apartments at Davis Springs even if it acquires the other site. It has an additional 25 to 30 acres on the 100-acre Davis Springs site that could be rezoned for apartments. Two apartment projects announced several years ago along East Riverside Drive are ready to move forward as the local multifamily market heats up. With a third project under way, the plans will add 780 residential units to an area that has seen little new development in recent years. Developers say that over the next several years, their projects will bring new investments and help reshape an area with a high crime rate AMLI Residential was the first developer to build a major new project in the area. The 375-unit AMLI South Shore apartment complex opened last year, and AMLI said leasing is ahead of expectations, with occupancy now at 73 percent. Aside from apartments with amenities such as a swimming pool and on-site fitness center, the project has attracted new street-level retail. That success, coupled with a loosening of financing for new apartment development in recent months, has prompted other developers to start projects. The new projects come as Austin's apartment market turns in landlords' favor. "Breaking historical trends that produced only one positive quarter per year, the first quarter continued to see increases in both occupancy and rent," the report said. The report said the local apartment market should continue to see growth during the next 12 to 18 months. However, it cautioned that many of the new tenants are "out-of-state job seekers" who may or may not find work. Another concern is "a construction pipeline that includes over 20,000 new units." A failed downtown-area condominium project could be revived as apartments, and a fast-food restaurant could give way to a boutique hotel-condominium project, as developers move to take advantage of Austin's strengthening economy and an improved climate for construction financing. "The apartment market is recovering very nicely," Cureton said. "Demand for apartments and rents have risen substantially." Aquaterra, announced in 2006, was designed to be 19 stories high, with 173 units. But Crescent shelved the project during the recession. Brett Rhode, an Austin architect who designed the original project, said the project is being reconfigured for apartments. "The atmosphere is much more positive now than even a few months ago in terms of moving forward with projects in the downtown area," said Rhode, principal with Rhode Partners. "It's likely we will see some of our stalled projects come back to life, giving us a chance to rethink and improve our designs." Switching to apartments would be "an obvious choice" for developers who own sites that already have entitlements, he said. "Since the beginning of the year, the capital markets have loosened up, and the apartment fundamentals have gotten better," he said. Plans are on to turn a former North Austin industrial site into the $200 million Crestview Station, which will be one of Austin's biggest transit-oriented developments. A commuter rail station is planned for Lamar and Airport boulevards The project, which is bordered on one side by the Capital Metro commuter rail line, is designed as a community where people live, work and shop without having to drive. High Street Residential, a Trammell Crow subsidiary, will build the multifamily component. The mix will include live-work units and loft-style Austin apartments. This projects adds 300 apartments in Austin and 60,000 square feet of retail. BEE CAVES VILLAGE – Criterion Property Company LP, a company which previously has developed apartments in Massachusetts, has entered the Texas multifamily market with the Windsor at Bee Caves Village. The complex has 293 luxury units on Hwy 71, a nineteen acre site adjacent to the Hill Country Galleria and the Shops at the Galleria. Note: MSA data is base on 1999 MSA definitions.